Abundant wildlife-watching opportunities, deep in the backcountry and up-close in public places, is often a top reason people are attracted to Colorado as a place to live and visit. Few other places in the country offer such epic wildlife viewing that includes a chance to see—and photograph—majestic large animals like bighorn sheep, moose, elk, bear, lions, mountain goats and mule deer in their natural environment. Bald eagles, hawks, osprey and hundreds more bird varieties only add to the experiences that for many can be once in a lifetime. The Northern Front Range, including the Peak to Peak Scenic and Historic Byway, is the gateway to some of Colorado’s best wildlife-viewing prospects. Rocky Mountain National Park can be an obvious choice—and is indeed the most popular—to spot the state’s large mammals, birds and smaller critters. Millions of acres of National Forest, wilderness areas, state parks and other public lands across the region, however, are home to the same variety of animals and means the natural habitat of more than 900 species of Colorado wildlife is just a short drive from any of the mountain communities of Clear Creek, Gilpin, Boulder, Larimer and Northern Jefferson counties. October is an exciting time to experience Colorado’s wildlife wonders. Cooler temperatures and limited resources at higher elevations cause large animals to move closer to civilization and natural spectacles like the elk rut—the mammal’s mating season that features distinctive behavior and bugling from the males—make the season unique. It generally lasts from mid-September to mid-October, although elk can often be heard bugling into November. With about 3,000 elk in Rocky Mountain National Park and Estes Park alone, interactions between humans and elk happen daily. 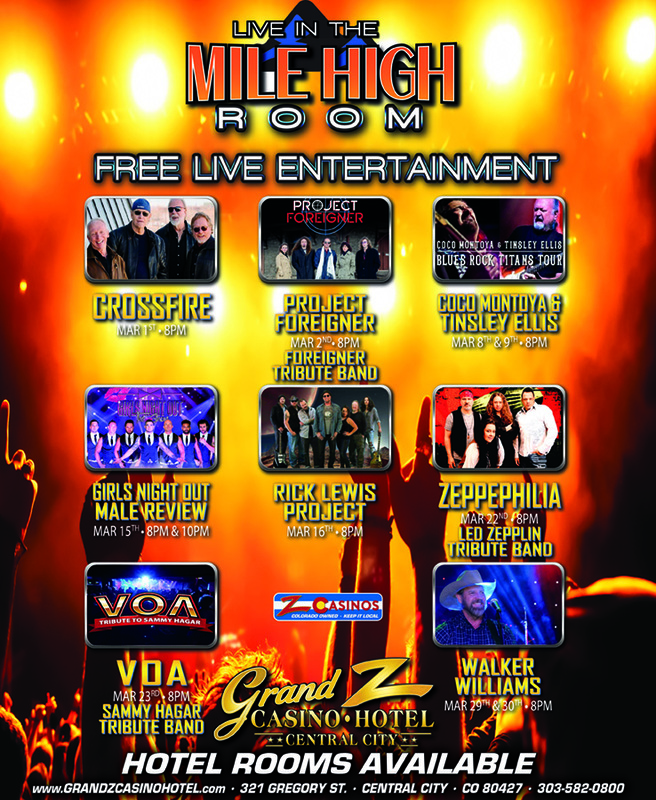 Fall also offers some fun and educational wildlife festivals including Elk Fest in October and the Georgetown Bighorn Sheep Festival in November. Christmas Bird Counts, where more than 50,000 observers participate in an all-day bird census, also take place in December. 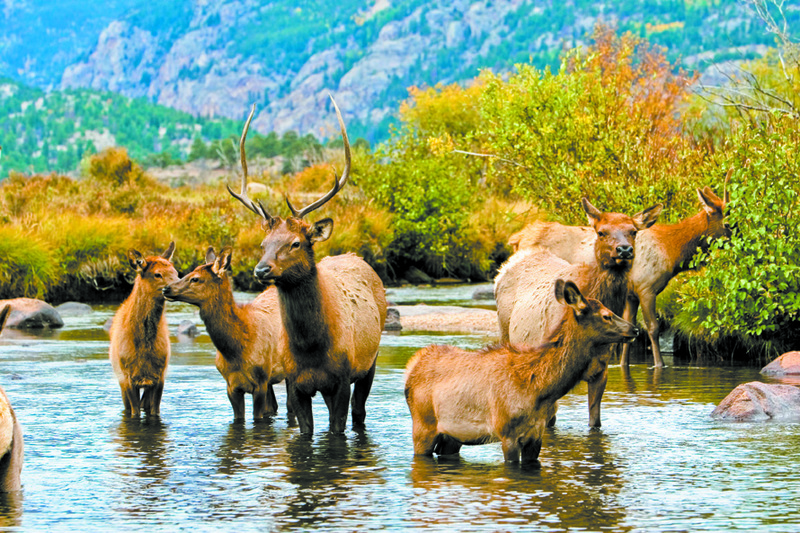 During Elk Fest in Estes Park, Oct. 3-4, visitors can attend education presentations, listen to live music, visit vendor booths, enjoy the beer garden, cheer on bugling contest participants and more. Colorado Parks and Wildlife provides multiple educational booths, an Elk Camp simulation to provide hunting information, public elk biology and management seminars, and our expert volunteer guides provide biological and behavioral information, as well as responsible viewing tips where elk are located in town. Celebrate Colorado’s state mammal—the Rocky Mountain bighorn sheep—when Georgetown and the Colorado Parks and Wildlife offer opportunities to watch and learn about one of Colorado’s oldest bighorn sheep herds, Nov. 14, at the Bighorn Sheep Festival. The event includes speakers and short wildlife educational programs for the entire family. Artisans will showcase wildlife-related art, gifts, crafts and other goods. The Georgetown Loop Railroad features Sheep Trains when a Colorado Division of Wildlife representative is onboard to talk about the animals. Any time of year can be a great time to see wildlife in the Northern Front Range mountains and the region offers many top spots that increase your chances of doing so. Clear Creek County is the perfect place to see bighorn sheep and mountain goats. As many as 350 bighorn sheep utilize the habitat near Georgetown, often standing very close to Interstate 70. They are also often spotted in various places along Clear Creek Canyon. 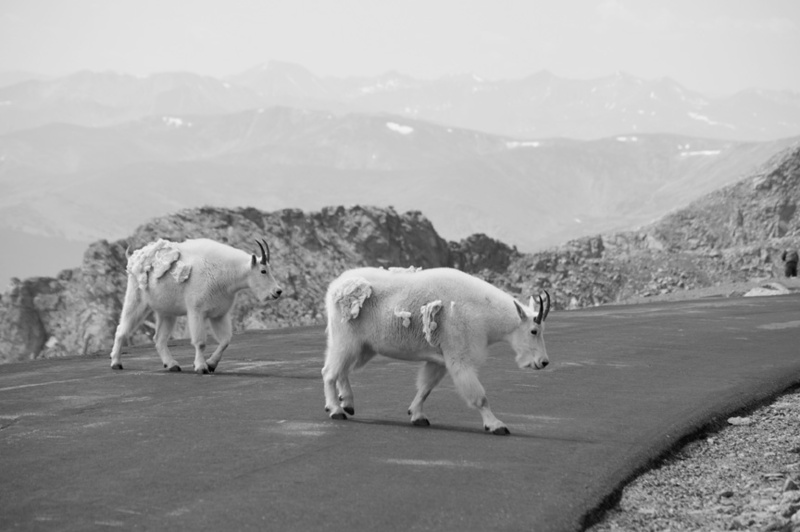 Mountain goats are almost always visible on the Mount Evans Scenic Byway, which ends just before the 14,264-foot summit. Pikas and marmots are also abundant. The Georgetown State Wildlife Area is a developed interpretive site overlooking nearly year-round bighorn sheep habitat. The viewing station gives excellent views of bighorn sheep habitat across I-70 and has viewing scopes. Bighorn sheep can be seen all year, but the best viewing is in fall, winter and spring. Volunteer naturalists are available on weekends from late November through January. Driving Guanella Pass Scenic Byway out of Georgetown is known as a “quick study in Rocky Mountain ecosystems” and is always a great place to view wildlife. Clear Creek, along with the rest of the region, is also home to deer, elk, fox, bear, lions, bobcats, wolverines, mink, beaver, muskrat, porcupine, marten, skunks, raccoons, chipmunks, ground squirrels, rabbit, eagles, falcons, ptarmigan and several other small animal, bird and fish species. Nearby Genesee Park in Jefferson County, which is Denver’s first and largest mountain parks, is home to one of Denver’s two buffalo herds, which are descendants of the last wild herd of bison in North America at Yellowstone National Park. The Lookout Mountain Nature Center and Preserve, also in JeffCo, features 134 acres providing habitat for black bears, mountain lions, bobcats, mule deer, elk and Abert’s squirrels. The Arapahoe and Roosevelt National Forests—including its Indian Peaks, James Peak, Cache la Poudre, Byers Peak, Comanche Peak, Mount Evans and other wildness areas—offers access to pristine, high-elevation backcountry and abundant wildlife in its Boulder, Canyon Lakes and Clear Creek ranger districts. Golden Gate Canyon State Park in Gilpin and Jefferson counties offers varied habitats, including mountain meadows and wooded slopes. With elevations ranging from 7,600-10,400 feet, the park has a variety of animals and is known for excellent birding. In addition to jays and Clark’s nutcrackers, watch for chickadees, juncos, sapsuckers, western tanagers, grosbeaks, bluebirds, snipes and swallows. Raptors include eagles, prairie falcons, and various owls and hawks. Deer and elk are often seen and a trout viewing pond is located at the visitor center. Several open space parks in the foothills and mountains of the region add even more places for outstanding, yet easy, opportunities to spot wildlife. Bald Mountain, Betasso Preserve, Caribou Ranch, Hall Ranch, Heil Valley Ranch, Mud Lake, Twin Lakes, Walker Ranch and others in Boulder County are known as hot spots for wildlife. The same can be said for Centennial Cone Park, Clear Creek Canyon Park, Coal Creek Canyon Park and White Ranch Park in Jefferson County and Hermit Park in Larimer County. 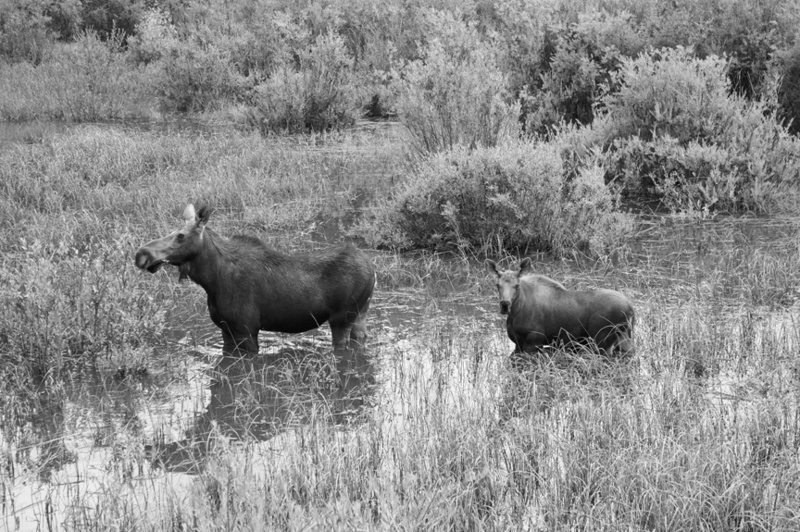 Caribou Ranch and Mud Lake open space park can be some of the best places to se a moose. The fall is also the moose mating season and when they become more social. Moose have few natural enemies and do not fear humans like other big game. Moose often tolerate humans longer and at closer distances. They are extremely curious and often approach humans and houses. Like all large beasts, these formidable animals must be given space and respect in the wild. Visitors to Rocky Mountain National Park are always looking to view wild animals, especially big ones. The park’s great large-animal population makes it one of the country’s top wildlife watching destinations. More than 60 species of mammals, 280 recorded bird species, 11 species of fish, and countless insects, including a large number of butterflies, are found within its borders. Horseshoe and Moraine parks inside the National Park are excellent for viewing elk, particularly during the fall rut when hundreds of animals may be present. It is likely the best site in the state to experience elk bugling, sparring and mating behavior. Horseshoe Park is good to see bighorn sheep in fall and winter. Coyotes, mule deer, ground squirrels, chipmunks, cottontails and birds are also abundant. Paved roads traverse both parks and animals are easily seen from vehicles. The Estes Valley outside of the park is also famous for its wildlife. Check open, grassy areas for elk, which can be seen almost anywhere, even in yards and along streets. Watch for bighorn sheep along Fall River Road between Estes Park and the entrance to Rocky Mountain National Park. Mule deer, coyotes, Wyoming ground squirrels, chipmunks, voles, muskrats and beavers can also be seen. Excellent waterfowl viewing, especially in fall and winter, is available around Lake Estes. Mallards, teal, coots, geese, white pelicans and others can be seen. In winter, watch for goldeneyes, common mergansers, redheads, wigeons, trumpeter and tundra swans, as well as bald eagles, northern shrikes, Thayer’s gulls and more. Prairie falcons and red-tailed hawks and often be spotted on nearby power poles. When viewing wildlife it is important to stay safe, observe the warning signs against approaching animals and any posted seasonal closures. Caution and common sense go a long way in preventing potential problems. The Colorado Division of Wildlife recommends to time outings for dawn and dusk when wildlife is most active, find a likely spot for activity and sit quietly, keep your distance, avoid sudden movement or loud noises, use binoculars, pull off the road and use your car as a viewing blind and leave dogs at home. Always keep in mind, if an animal changes its behavior, stops eating or seems nervous, it’s time to move away. During the rut, animals can become dangerously aggressive. Never approach a calf or a fawn even if it appears to be alone as the mother is likely near and will defend her young. In Colorado, feeding deer and elk is against the law. Feeding food to wildlife can be harmful to them, cause them to alter their natural behavior to become tolerant of humans. It can, therefore, be very dangerous for people, too. Tags: Arapahoe and Roosevelt National Forests, Caribou Ranch, Clear Creek County, Elk Fest, Georgetown Bighorn Sheep Festival, Georgetown State Wildlife Area, Golden Gate Canyon State Park, Lookout Mountain Nature Center and Preserve, Rocky Mountain National Park, Wild Bear Mountain Ecology Center, Wildlife Viewing. Bookmark the permalink.